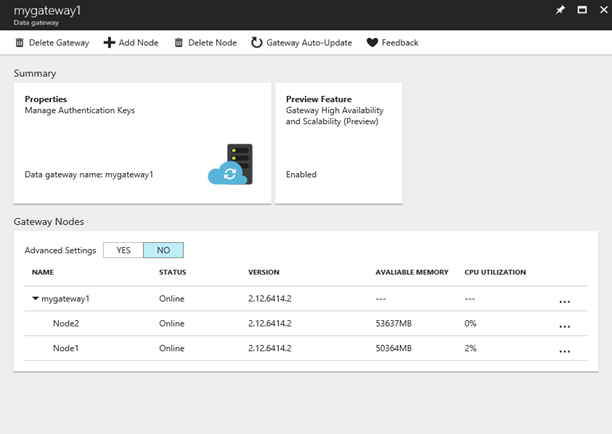 We are excited to announce the preview for Data Management Gateway - High Availability and Scalability. 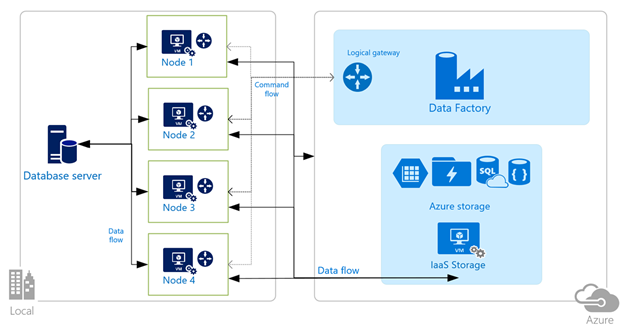 Higher availability of Data Management Gateway (DMG) – DMG will no longer be the single point of failure in your Big Data solution or cloud data integration with Azure Data Factory, ensuring continuity with up to 4 nodes. Improved performance and throughput during data movement between on-premises and cloud data stores. Get more information on performance comparisons. Both Scale out and Scale up support – Not only the DMG can be installed across 4 nodes (scale out), but you can now increase/decrease the concurrent data movement jobs at each node (scale up/down) as per the need. Note: The Scale up/down feature is now available for all existing Single Node (GA) gateways. This update is not limited to this preview. Richer Data Management Gateway Monitoring experience – You can monitor each node status and resource utilization all at one place on the Azure Portal. This helps simplify the DMG management. Note: Monitoring is now available for all existing Single Node (GA) gateways. This update is not limited to this preview. For more information on the Data Management Gateway ‘High Availability and Scalability’ feature check our documentation. Scenario 1 – Setting up a new ‘Highly Available and Scalable’ Data Management Gateway. Scenario 2 – Upgrading existing Data Management Gateway to enable the ‘High Availability and Scalability’ feature. Prerequisite – This preview feature is supported on Data Management Gateway version 2.12.xxxx.x and above. Please make sure you are using version 2.12.xxxx.x or above. Download the latest version of Data Management Gateway here. In case you have any queries, please feel free to reach out to us at dmghelp@microsoft.com.